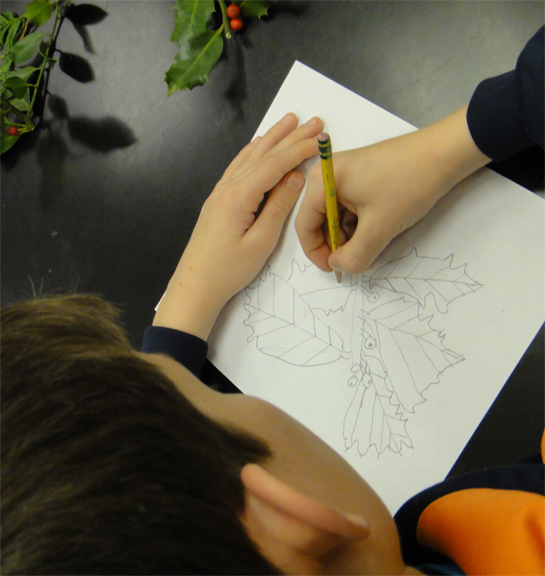 "Making accurate observations to reveal the anatomy of plants"
What a festive way to learn about plants! 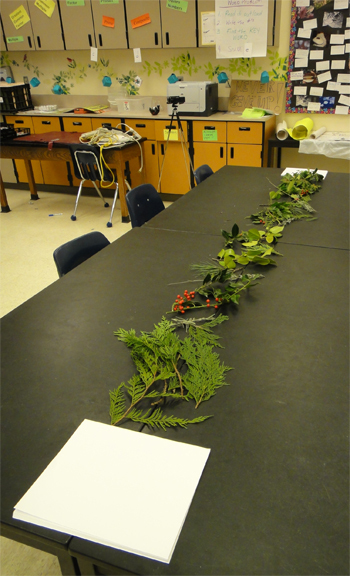 Thank you Mrs. Dougherty for filling up the classroom with specimens of winter plants. They inspired beautiful drawings and insightful observations about the world of plants! I can't wait to come back to continue to explore and learn more about flowers in January 2016. 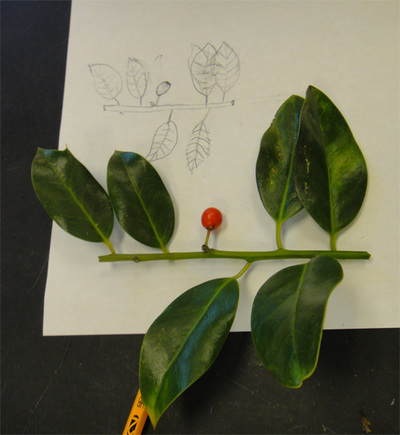 Look at the drawings of these talented students! 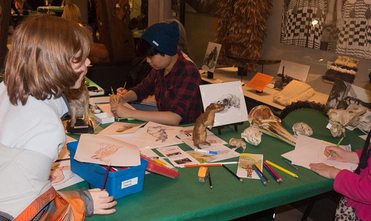 Thank you Inger, Rachael, Barbara, Alyssa and Elizabeth from the Guild of Natural Science Illustrators Northwest for sharing your skills with families visiting the museum and drawing alongside young artists learning about mammals. "Scientific Illustration" at the Family Event Burke Museum of Natural History and Culture, University of Washington, Seattle, WA. 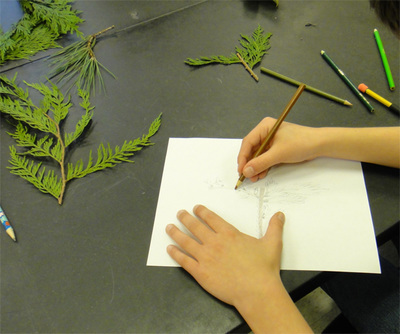 Thank you to Laura, Krister, Cyndi, and Jennifer from the Guild of Natural Science Illustrators Northwest who spent the day demonstrating illustration skills to visitors and encouraging young artists to join in the fun of observing and drawing birds. 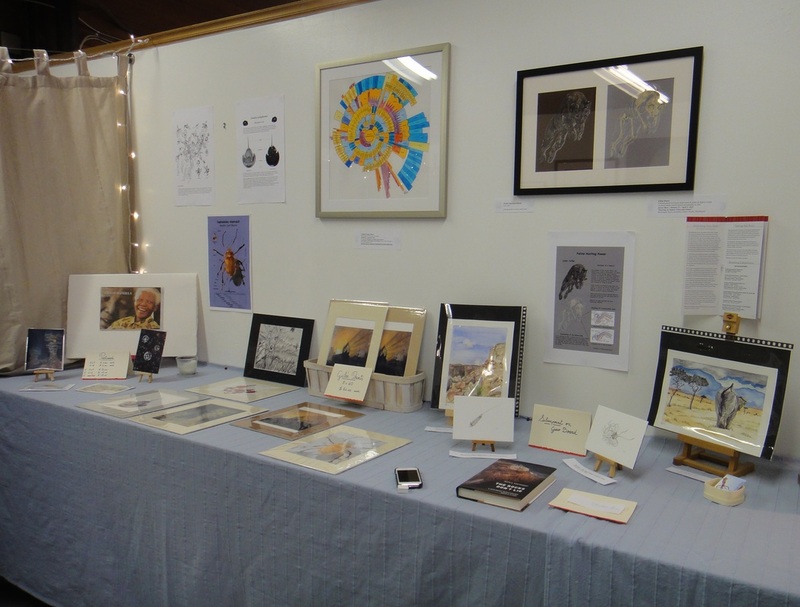 And thank you to the Museum for the lovely samples of bird wings, bird skulls, and mounted specimen that illustrators could sketch and draw. ﻿Burke Museum of Natural History and Culture, University of Washington, Seattle, WA. 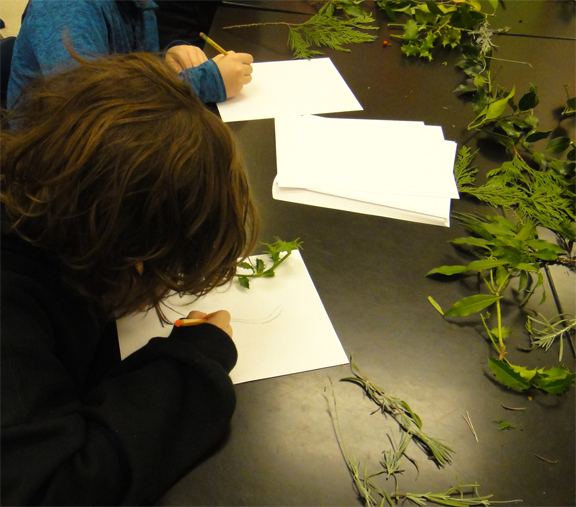 So much fun observing, drawing, and learning about "bugs" with visitors of all ages. What a treat to be surrounded by thousands of specimens of creepy-crawly creatures - insects, arachnids, myriapods, and crustaceans. Thank you to Alyssa, Katherine, and Terri from the Guild of Natural Science Illustrators Northwest who spent the day with me sharing their time, skills, and enthusiasm with curious mind from so many countries. Japanese, Russian, Ukrainian, French, Canadian, Indian, and US families stopped by the "Illustrators at Work" station to chat, color, and draw bugs. "Deep, Deep Down in the Dark Pacific Ocean"
Horace Mann Elementary School, Redmond, WA. Seventy four students took a virtual dive to the seafloor 7,000 feet under the surface of the Pacific Ocean to explore deep sea vents and their unusual inhabitants. The students had lots of great questions about diving, life in the dark ocean, and how to survive the extreme pressure. 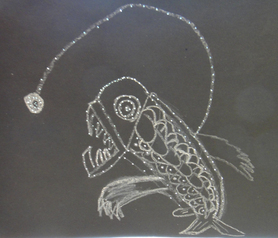 And they taught me a lot about viperfish, a deep-sea, bioluminescent predator that they had studied and drawn in class earlier that week. "Exploration of Washington Geology" - French American School of Puget Sound, Mercer Island, WA. Thirty two students and four of their instructors traveled with me over 600 miles around the state of Washington. Together we learned what geology is and what geologists do. How are mineral and natural resources managed? Why are these resources important to our society? 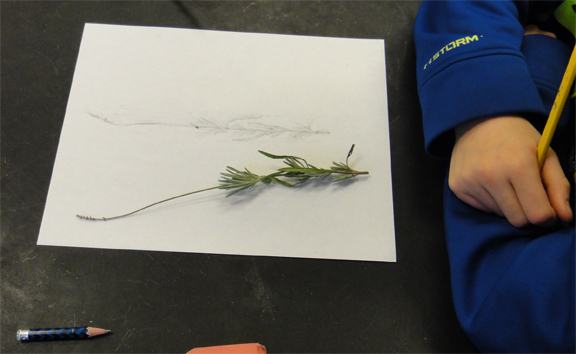 From the high peaks of the Cascade Mountains to the desert of the Columbia River plateau, students learned how to recognized how water carves and erodes the landscapes. 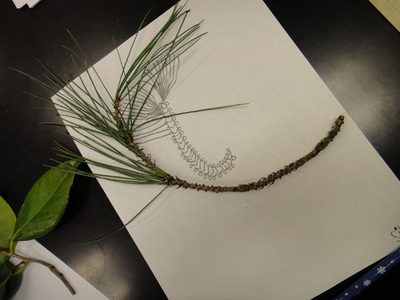 They did field work including landscape analysis, mapping, and collecting samples of rocks and fossils. They sampled lava flows and learned about the formation of flows and basaltic columns. A voyage through geological times to get an overall introduction to the geological history of Washington - deposition of sediments, formation of mountains, volcanic eruptions, giant floods and ice age glaciation that gave our state its current shape and beauty. Ocean Research College Academy (ORCA), Everett Community College, Everett, WA. I enjoyed a day of seagoing work with the students of ORCA Cohort 11 that I had met in January of this year. The students are now experienced sailors navigating the research vessel Phocoena, making observations of marine and land organisms, and collecting data in the waters off the coast of Everett. On their 85th monthly "State of Possession Sound" research cruise, these 1st year students measure dissolved oxygen, temperature, salinity, and pH in the water column. They also collect plankton and sediment samples in Puget Sound to monitor the state of the Salish Sea that they are learning to understand. Next year, they will present their research projects at regional conferences in our region. INVITED SPEAKER - Issaquah High School, Issaquah, WA. I love sharing my experience in marine geology and deep-sea exploration with students of all ages. I had the chance to address two classes of marine biology and take these students on a virtual adventure 7,000 feet under the Pacific Ocean. Burke Museum, University of Washington, Seattle, WA. Dino Day at the museum was an incredible success! With other scientific illustrators from the Guild of Natural Science Illustrators Northwest we drew, colored, and cut out dinosaurs all day with very energetic dinosaur fans. A non-stop stream of families and their talented, burgeoning paleontologists created drawings, collages and masks of Triceratops and Edmontosaurus inspired by the museum's spectacular specimens. 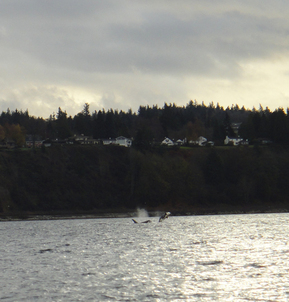 Breaching orcas - Orcinus orca - greet the new research vessel "Phocoena" on its first voyage in Puget Sound - November 22, 2014. Everett Community College, Everett, WA. students of the Ocean Research College Academy. ORCA, this early college high school academy uses the local marine environment as the unifying theme to integrate the core academic disciplines. 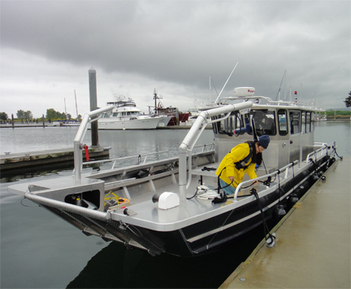 Located in a state of the art facility on the Everett waterfront, the school provides students an oceanographic research lab an a dedicated research vessel. 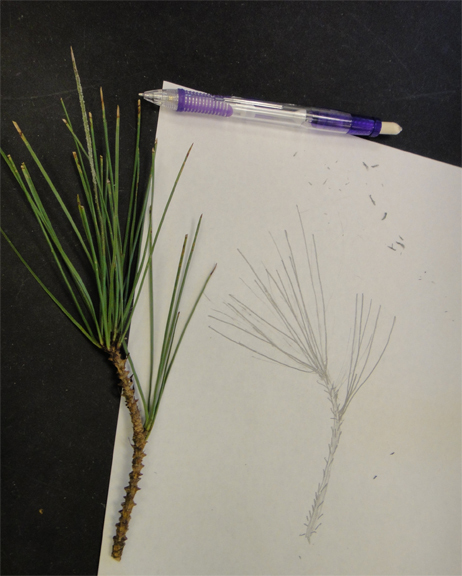 We discussed visual tools for science communication with the students of cohort 11 and the common concepts that artists and scientists use to express their ideas. These budding scientists will soon present their ocean research to colleagues at professional conferences. 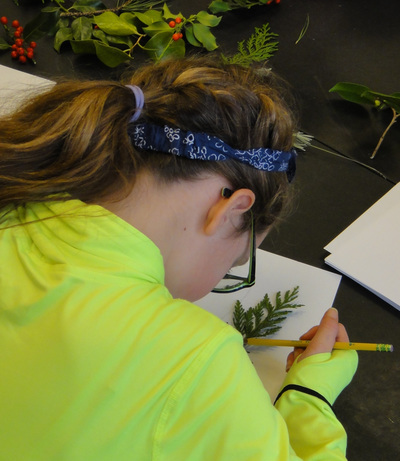 They are also enthusiastic about explaining to family and friends what they are studying in the Puget Sound and how their hard work contributes to a better understanding of our region, its environmental concerns and role in global issues. All Content Protected by The Copyright Act.